We live in a fast-paced world that measures achievement by the bottom line. People who fail to produce results quickly and consistently are as expendable as yesterday’s newspaper. By every standard the world holds as important, it would seem that Jeremiah’s ministry was a monumental flop. Yet the story of his ministry is preserved for all time as a significant piece of the mosaic that portrays Israel’s history. What, then, does Jeremiah teach us about success and significance? What indeed does God require? In every respect, Jeremiah’s ministry was successful in God’s eyes because Jeremiah unflinchingly and obediently proclaimed the message of God throughout the course of his forty-year ministry. Rather than measure success by the number added to the temple roll, Jeremiah claimed success from his resolve in the face of threats from the very people he was sent to warn. Obedience, as it turns out, is the yardstick by which God measures success. In Jeremiah we see the high cost of obedience to the prophetic calling. And yet, this call did not smother his humanity. Jeremiah has often been referred to as the “weeping prophet” because of the tears of compassion he shed for his people. At the same time, he demanded vengeance on those who threatened him. In Jeremiah’s life, we witness the dynamic struggle of one who could not separate himself from the burden of the message he was charged to deliver. 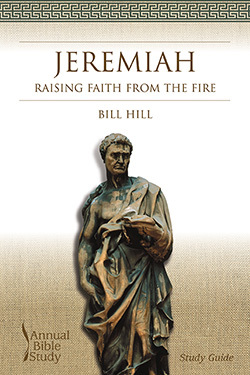 Explore Jeremiah’s significant and challenging life in the 2005 Annual Bible Study. Both the Teaching Guide and Study Guide, which are illustrated with art images, photos, and maps, were written by Bill Hill, pastor of Wornall Road Baptist Church in Kansas City, Missouri. Each chapter in the Jeremiah Teaching Guide includes teaching options, a suggested worship outline for both a contemporary and traditional service, and approaches for leading discussions. The study examines biblical background, historical interpretation, as well as spiritual, ministerial, and theological themes. It also includes relevant lesson plans for children and youth. The Jeremiah Study Guide serves three purposes: to educate the learner on major issues of appropriate interpretations, to offer an overview of theological themes, and to build the learner’s Bible study skills by considering several significant interpretations.